Out of the many different fence companies across Long Island, we’re the best at installations, replacements, repairs and more. You can easily add extra safety and charm to your property with railings on stoops, balconies, and more. A gate is the perfect addition to your fence, whether it’s for your home or business. All of our materials are only of the highest quality. We carry only top of the line name fence brands, so you know you’re receiving the very best. In addition, our installers possess years of experience in the field and work to make sure that you’re truly delighted with your investment. Our specialties are high quality fences, railings, and gates. All of these services offer both safety and aesthetic appeal. 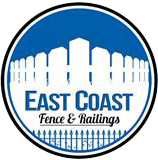 There are many Long Island fence companies, when you choose East Coast Fence & Railings, you’ll be making the right choice. We take experience pride and joy in every job we perform! Our number one goal is to leave our customers satisfied and happy. In addition, we value our customers’ safety. That’s why we’re known as one of the finest fence companies on Long Island. As one of the fence companies on Long Island, East Coast Fence & Railings offers completely free estimates. Take advantage of this now and schedule an appointment with our fully licensed and insured professional fence company. Our fence company is prompt and coupled with competitive pricing, which makes us a smart economical choice out of all the Long Island fence companies. We guarantee that you’ll experience 100% satisfaction with the final product.